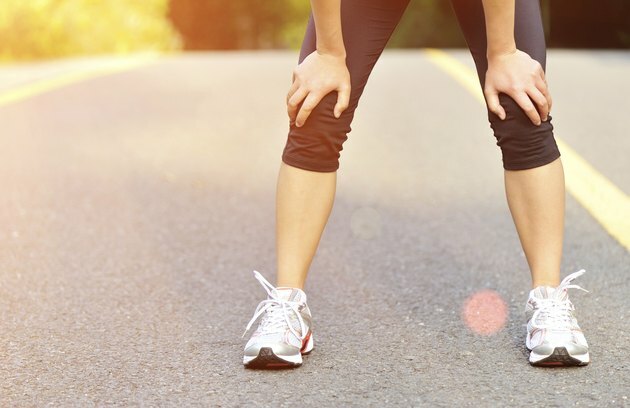 Fatigue during exercise occurs during both short-term and prolonged exercise. The energy and power generated by contracting muscles depletes the body energy stores and sensations of fatigue and exhaustion appear. The relationship between exercise and fatigue has been an area of interest, with multiple research studies focusing on the main causes of fatigue during exercise. Research studies demonstrate that fatigue occurs when certain substances accumulate or others become depleted. During a resting state, the muscles store carbohydrates in the form of glycogen. When you perform exercise, your body breaks down this stored glycogen and turns it into usable energy. Depletion of muscle glycogen is generally the primary cause of fatigue, although your muscles can exercise two hours or more at a continuous high-intensity pace before fatigue begins. Intermittent or lower-intensity exercise uses up stored glycogen much more slowly, delaying fatigue. Most athletes performing prolonged high-intensity exercises consume sugar-containing drinks to avoid fatigue. Fatigue may also be caused by hormonal changes in the body. Serotonin, a neurotransmitter in the body is associated with sleepiness and lethargy, increases during prolonged exercise. When you exercise for an extended period of time, you may experience a noticeable decrease in energy levels. This decrease is caused by your body's working muscles releasing tryptophan, an amino acid that stimulates serotonin production. Another hormonal change is the body's production of cortisol, a proinflammatory hormone. In healthy people, the concentration of cortisol decreases during the early stages of exercise, but then begins to rise during prolonged exercise, usually after about an hour. The overproduction of cortisol may be a factor in fatigue as the body changes hormone production. Creatine phosphate is a molecule that plays a part in powering skeletal muscle during exercise. Creatine phosphate's main role involves reforming ATP, a high-powered molecule that powers muscle cells to contract. The action of creatine phosphate ensures that ATP does not fall below 70% of the preexercise level. During prolonged exercise, levels of creatine phosphate decline, causing the muscles to receive less energy and become fatigued. Fatigue occurs because of multiple causes and research points to certain compounds and hormones in the body being partially responsible. However, two of the primary causes remain increased core temperature and dehydration. Both of these causes affect the cardiovascular system, lowering the force and endurance of muscles and causing fatigue. Many athletes drink cold fluids during exercise to keep their temperature within normal limits while also re-hydrating and prevent muscle fatigue.